Signet rings are one of our most favorite and best selling items at deBebians. In historical times, signet rings had an important meaning in society. Rather than signing a document, people used the signet ring to make their mark, by pressing them into wax or clay, which would function as a seal. As far back as 3500 BC, people in Mesopotamia began using signet rings. In ancient Egypt, pharaohs and nobles used signet rings to put distinctive marks on their pottery. In Medieval times, important people used signet rings to sign and seal their letters. They seem to always have been popular, but became even more with the rise of the bourgeoisie. Having a signet ring would be a prominent sign to show that you are of a higher class. They would mostly be worn by politicians, wealthy citizens, and religious leaders. Nowadays, signet rings are more of a personalized jewelry rather than identification. Some people use their initials, while others a family crest or any other designs. They are no longer made to create impressions, typically. Worn by both women and men, signet rings are seen today as a fashion statement accessory. Many times they are purchased as a gift for a son or daughter with the representations of family ties. I think it’s a great tradition. You can order them blank or with the engraving, or even customized and adorned with precious stones like diamonds or crystals. 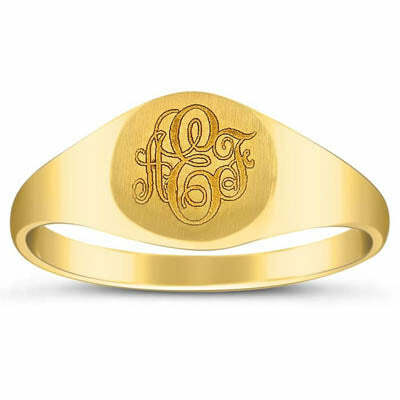 My favorite look is hand engraved monogram on the face of the signet ring, which is a very classic look ! Click the link below to see more some styles to chose from and our entire selection.